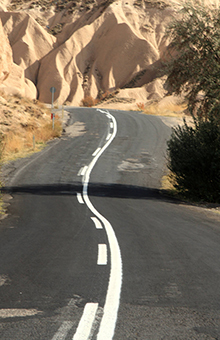 Cappadocia, with its unreal rock formations, cave dwellings and “fairy chimneys” is undeniably one of Turkey’s most captivating, unique and unmissable areas and a perfect destination for a road cycling tour. This tour links Cappadocia with the nearby Aladaglar Mountains – a jagged alpine range of limestone peaks surrounded beautiful forests, canyons and waterfalls. Designed to satisfy keen cyclists without being overly demanding, the tour includes some long days but the effort is more than rewarded. We get the most from our time by using minibus transfers to cut out any unsuitable areas, leaving an itinerary jam packed with highlights and offering first class riding throughout. The tour is a true journey of discovery that covers much of this intriguing region. There is much to explore along the way, and beyond the usual scope of stop-learn-take photo you will genuinely be able to explore and discover yourselves. Cappadocia is a land that frees the Indiana Jones inside us all, with history around every corner and an incredible mix of colours and cultures. We stay at boutique hotels wherever possible, the best places utilising traditional cave rooms combined and authentic furnishings. In most cases you will stay in family owned, small hotels, which reflect the nature, history and culture of the area well. Food is without doubt another highlight of the experience, with evening meals and lunches to be savoured at carefully chosen, high quality restaurants. Expect hearty portions of central Anatolian specialities like pottery kebab, home made ravioli and meat and vegetables stewed in clay casserole dishes, alongside lighter, more national dishes like meze, fresh green salads and fish. Click here to view the full itinerary! We have been based in Goreme, the jewel in Cappadocia’s crown, for the last 10 years, and know the region’s roads like the backs of our hands. The choice to combine this tour with a circuit of the Crimson mountains came out of Cappadocia’s relatively small geographic size and the desire to create an even more memorable itinerary. The region has perfect riding conditions from May to October though the high summer of July and August may be too hot for some. The tour starts and finishes in Kayseri, the capital of Cappadocia. Modestly priced flight connections are available, normally via Istanbul. Settled throughout time by Hittite, Persian, Romans, Byzantine and Ottoman civilisations, many of these caves are still decorated with icons and wall paintings from the early Christian times. Cappadocia is rich with history and filled with natural wonders! Click here for more information on Cappadocia. By riding with one of our professional guides you will not only learn so much about the places you ride through, but enjoy the company and companionship that social cycling provides. These tours run on fixed dates throughout the year and are open to single riders willing to share a twin room with no single supplement. 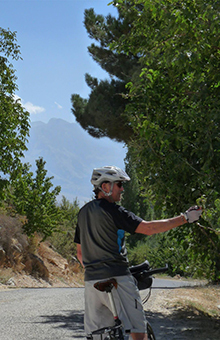 All guides speak English fluently and have extensive cycling experience in the region. These tours include all meals at excellent and well-chosen restaurants. The group size is between 6 and 12 although smaller groups and bespoke guided tours are available on request. This option puts one of our professional biking guides in the driving seat of your support vehicle. It’s the best way to enjoy the support and assistance that a fully guided tour provides but gives you the freedom to explore at your own pace and make your own choices. Not only will your baggage be transported from hotel to hotel but you will enjoy full technical support and route assistance at every stage- just like having a driver and a guide in one. This option includes evening meals but lunches are extra. Please ask for prices for groups larger than 2 Pax as the quoted rate is based on 2 people sharing a support car and driver / guide and larger parties will always cost less. Dates tailored to your preference and departures are available throughout the year. For those who prefer the freedom and value that self-guided tours offer, this is the best option. Your baggage will be transported from hotel to hotel, and you will still have a support car and driver following you (out of sight) along the route. But with this option your driver may not speak much English, and certainly won’t have the skills or knowledge of an expert guide. These tours are bed and breakfast only, leaving you free to make your own meal arrangements. We can add a half board supplement if you prefer, and all hotels are able to produce excellent meals. Please ask for prices larger than 2 Pax as the quoted rate is based on 2 people sharing a support car and driver. Dates tailored to your preference and departures are available throughout the year. Including all meals and snacks. For groups of less than 6 surcharge of 100 Euro per person is added to the price. Smaller groups and bespoke guided tours POA. Includes 8 evening meals at top quality restaurants and English speaking professional guide / fixer / driver at your disposal 24/7. Price based on 2 people travelling. Half board accommodation with in hotels or good quality restaurants. 8 nights hotel accommodation. Transfers to and from Kayseri airport. Professional guide. Full use of support vehicle. Flights. Alcoholic and soft drinks available at camps or restaurants, drinks or extras at optional cafe stops and entrance fees to historical sites and museums. Tips for guides and driver. 9 days. Shorter or longer itineraries possible by arrangement. 3-4: Challenging sectors and a daily distance of around 80km requires a good level of fitness, although a support car is provided. 7 days multi centre road bike touring. Self guided options are also available. Equipment advice: A road bike or lightweight touring bike is strongly recommended for this tour. We recommend 25-35mm tyres, ideally of a toughened type, as the road surfaces can sometimes be a little rough. Hi Rameesha. The Cappadocia Road Biking tour is available to book for June 2017, and the tour comes highly recommended. It’s a challenging, yet easy going programme, all on back roads without too much traffic. You get to cycle all round the region of Cappadocia, but in addition to the more commonly visited areas around Goreme and Urgup, we also see the Hasan and Erciyes volcanoes and ride around the Aladaglar / Crimson Mountains. Hotels are good quality, some are boutique, some authentic cave houses, and others rather more rustic. Food is first class and all diets can be accommodated. Guide is English speaking Turkish, certified and registered. 2- my preference is to join group with guide but with private room in the hotel is that possible . And how much is the price for that . Hello there, nice to hear from you. If you prefer to cycle on the roads then this tour is ideal- there is not much traffic and the scenery is beautiful. The tour as listed here costs 800 Euros per person for a 3 person group if are able to share a triple room (where available). This is a half board price and includes good quality evening meals each day. I’ll send you an email with some further details. 2 of us are interested in a tour starting March 1st and lasting 7-10 days 70-100km a day. I’m currently working in Izmir. Do you have anything available? What are your bike hire options? Do you offer self supported options (bikes with panniers and que sheets… no support van needed)? My husband and I are interested in doing your Cappadocia guided road tour next May or June 2015 and would like to take advantage of some of great airfares and book early. Would you have an idea of what your tour dates might be in 2015? I would like to know if you still have an available space for this trip and what would the cost be for one person. Hi Rebecca- yes, that’s possible- especially if you sister can join you! Full details on their way to you by email. Thanks! Hi, We are two students interested in the self guided tour in Cappadoce in September for 10 days. Is it possible to have further informations by email? Hi, we are interested in road biking in Cappodocia in either your October 2014 tour or self guided. Can you email me details of both? Is the self guided still supported in any way? Hi Rebecca. Thanks for getting in touch with us. The self-guided option is still fully supported, and both guided and self-guided options follow the same itinerary. I’ve sent you an email with some details, so will hope to hear back from you soon! My husband and I are interested in your cappadocia road trip that begins May 31. Do you have availability? What will typical day time temps be? What is the typical demographic profile of the people that do this trip? We are long time cyclists, aged 57 and 60, and have done many cycling trips. 60 to 80 km are our usual distances though we are capable of more. We live in a somewhat flat area so not much of our regular riding has a lot of ascent though we’ve done some on some of our trips (northern Italy). What are the grades on the climbs like and What kind of bikes would we be riding? we are interested in the Cappodocia self guided tour, Would it be possible to do it the week of 18th – 25 th May 2014. Hi there… Yes, it is possible and the best season to do this tour! I’ll send you an email with some more details about the self guiding options! Hi. I will be travelling as a single female. Would be comfortable riding level 4. Would it be possible to join an existing group? I am keen on all trips road and MTB a nd trekking if you are able to recommend a reputable trekking company. Flexible with dates.